Hello folks. Long time since an update. I’m neck deep into my advanced C# class at Oreilly School Of Technology. It’s about time I started updating the blog with the things I’ve been working on. To be honest this course, so far, has been the hardest for me. There are lots of concepts to grasp. My first lesson continued by introducing me to arrays, single, and multidimensional. So far this has proven to be vastly different than the collections I was working with during my last course. This course has also been working more with graphics along with data / memory manipulation. Fun stuff!!!! The game I worked on is basically a matching game. You would select one tile the try and find the next matching one. The 2-Dimensional array comes into play when storing the board size and tiles. You’ll see this from this from the source code. Then using the sender properties and comparing the buttons tag to each other to check for a match. If the two buttons in the array matched then they stayed flipped and turned green. If not the system would wait then flip back to question marks and you would try again. Remember if you want to download the source for this program visit the downloads section of the blog. Now onto viewing the source. //Saving the game board type and tile settings. //Now lets initialize the form components. //Checking to if the buttonrows have been set. //If not then default to 4. //Dimension the two dimensional array. //Loop thru each row and column of buttons. //Create a new Button each time the loops run and setting the Button properties. //Setting the current two dimensional array to reference the new button. //Add an event handler to take care of displaying the letters on each button. //Get the button control we need to respond too. //Checking to make sure the button clicked on has a question mark. //Making sure the user isn't clicking on the same button both times. //Or the user isn't selecting a button that's already part of a matched pair. 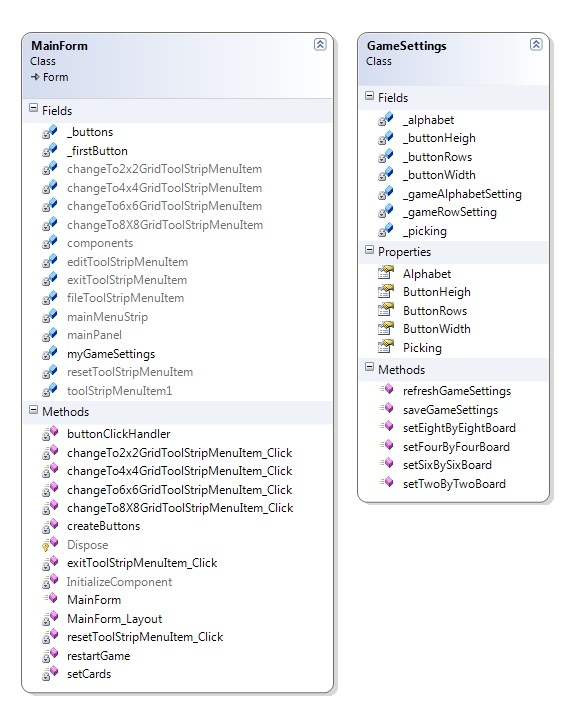 //Setting the first selected buttons properties. //Checking to see if the two selected button text strings match. //Setting the two selected buttons properties. //If the two selected button strings don't match. //Showing the second buttons text string and coloring it red. //Refreshing the buttons text so the user can see what it is. //Forcing the program to wait one second so the user can see the text of the two buttons. //Flipping the picking flag back to false for the next round of guesses. //Loop thru each of the buttons. //Replace the previous card text string with the temporary card text string. 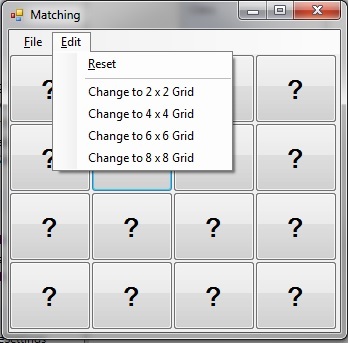 //This method makes sure that if the form is resized the buttons resize also. //Get the width and height for each button to be used inside the width of the panel control. //Loop thru and set the location and dimensions of each button. //Add the button controls to the panel control collection. //Checking to see if the panel is empty. //Looping thru the button rows and columns to add each button to the panel collection. //Setting the number of buttons rows and tile text. //Setting the game board width and height. //Setting the number of buttons and tiles. //Clearing the panel so it can be refreshed. //Refreshing the last game type settings. //Calling the createButtons method to reset the button text. //Calling the setCards method to rest the cards. //Forcing the panel object to update. //Loading the previously saved game type. //Clearing and panel so it can be refreshed. private string _alphabet = "ABCDEFGHABCDEFGH";    //Setting to default the game to a 4x4 grid. //Method to save the board type and tile settings. //Method to refresh the game settings when the game is refreshed. //Settings for a 2x2 gameboard. //Settings for a 4x4 gameboard. //Settings for a 6x6 gameboard. //Settings for a 8x8 gameboard.